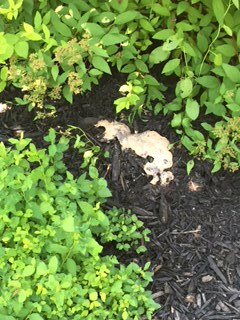 Tending your garden, you may have noticed the sudden appearance of slimy mass growing on the top of your mulch. It may have an unpleasant smell and comes in a variety of colours and textures. What you have discovered is Slime Mould. Also known as “Dogs Vomit Mould”, this mould is extremely common on the forest floor, and in healthy gardens rich in organics. 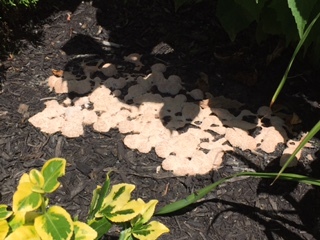 It has been observed that this mould tends to like mulched, damp garden beds and become more prevalent during the summer months. Slime Moulds tend to grow in and around decaying matter. This includes yard waste and decomposing mulches. The mould does not feed on the decaying matter itself; rather it feeds on the bacteria and any other fungal spores present. What is observed in the garden as a slimy or gelatinous mass is the active feeding stage of this moulds life cycle. It will take on various characteristics, sometimes appearing as a mottled mass that looks like dog vomit, other times it will take on bright bold colours like pink and orange. When it begins to appear gray and dry, the mould is beginning to produce its fruiting bodies. At this point it has almost completed its lifecycle. Regardless of the stage in which you find this mould in, it is considered harmless. There is no evidence to suggest that it will cause harm to children or animals if ingested. In regards to plant material, it will only cause adverse effects if the mass causes any shading of the foliage. To get rid of this unsightly and at times smelly mass, you have a couple of options. The most effective method is to shovel the mass into a bag and throw it out in your regular household waste. There is also the option of spraying the mass with a strong jet of water to break it up. However, the spores travel best in water and you may end up with multiple patches appearing should conditions be favourable. Otherwise, you can observe and enjoy the interesting and at times beautiful Slime Mould.